Objectives: To conduct a detailed analysis of preseason football injuries sustained in English professional football over two competitive seasons. Methods: Club medical staff at 91 professional football clubs annotated player injuries. A specific injury audit questionnaire was used together with a weekly form that documented each club’s current injury status. Results: 17% (1025) of the total number of injuries over the two seasons were sustained during the preseason, the mean number of days absent per injury was 22.3 days. Younger age groups (17–25 yrs) were more likely to sustain a preseason injury than more experienced players (26–35+) (p<0.01). There were relatively more “slight” and “minor” injuries (as defined in the methodology), overuse, and tendon related injuries sustained during preseason compared to the in season (p<0.01). The thigh (23%), knee (17%), and ankle (17%) were the most common locations for injuries during the preseason, there was a relatively greater number of lower leg injuries (15%) during the preseason (p<0.05). Achilles tendonitis was most prevalent in the preseason, with 33% of all Achilles related injuries sustained during this period (p<0.01). Muscle strains were the most common injury during preseason (37%). Rectus femoris muscle strains were observed twice as frequently during the preseason relative to the in season (p<0.01). Ligament sprains were the second most common injury during preseason (19%). Non-contact mechanisms were the cause of significantly more injuries during the preseason (p<0.01), with relatively more preseason injuries sustained while running or shooting (p<0.01). For 70% of the injuries reported during the preseason, the ground condition was described as dry. Conclusions: Players are at a greater risk of slight and minor injuries, overuse injuries, lower leg injuries (especially the Achilles tendon) and rectus femoris strains during the preseason period. Prevention of preseason injury is important to ensure availability of players for the commencement of the season and to decrease the risk of injury later in the season, we recommend the implementation of a risk management policy for this purpose. Areas requiring further investigation include methods of prevention for the common preseason injuries that have been identified, a detailed analysis of preseason and closed season training programmes, and a smaller study involving exposure data. Football is currently the most popular sport in the world.1,2 This popularity has massive financial implications especially when considering professional football. The 1999/2000 season saw the professional English football leagues (Premier and Football League) become the first in the world to pass the £1 billion income mark.3 The average club wages/turnover ratio has increased continuously over the last decade; the total wages and salaries figure for 1999–2000 was £747 million.3 The projected financial loss of output due to injury for that season was £74.7 million given that approximately 10% of a squad was unable to train each week.4 Additional injury “costs” could be included in the form of medical fees and increased insurance premiums. First choice players who are unfit to play as a result of injury may also add to the cost. Their absence may lead to a reduced club income due to reduced match attendances, and diminished prize money as a result of a low league position, and/or an early cup competition exit. The competitive season in England ends in May, the exact date depending on play off, domestic, and European cup commitments. Generally this is followed by the closed season that consists of anything from 2–5 weeks. Players subsequently return to the clubs for 4–6 weeks of preseason training in preparation for the beginning of the competitive season in August. One of the most significant findings from the initial Football Association’s epidemiological study was the disproportionately high number of training injuries during July (preseason), and match injuries during the early stages of the season.4 Several reasons for this increased incidence have been suggested, including hard playing surface,5 high training intensity,6 sudden change in training intensity from closed season to preseason7, and short preseason preparation.8 The objective of this study was to follow up the epidemiological study of Hawkins et al4 and conduct a detailed analysis of preseason injuries and associated extrinsic factors. Player injuries were prospectively reported from July 1997 to the end of May 1999 inclusive. A total of 91 of the 92 football clubs from the English football leagues (Premier and Football League) committed themselves to the project. Injuries were recorded by club physiotherapists and or physicians on a specific player injury audit questionnaire designed for this study. Injury audit questionnaires for players who had returned to full training/competition during a particular week were returned weekly together with a form indicating which players had been absent and the number of days and competitive matches each had missed that week. Before the study, club medical staff attended a briefing day and were given guidance notes on how to complete the questionnaires. Only professional players with a squad number were involved in the study. Participants were asked to complete a consent form and each club provided details of their squad at the beginning of each season. Table 1 presents the information obtained. New players who joined the club were included while players leaving clubs were omitted from the study if they did not stay within one of the four English leagues. A recordable injury was defined as one sustained during training or competition and which prevented the injured player from participating in normal training or competition for more than 48 hours, not including the day of the injury. Injuries unrelated to football were not included, nor was any absence due to illness. International duty injuries were included as details of such injuries are generally reported back to club medical staff. A preseason injury was defined as any injury occurring during the six week period between the end of the closed season and the beginning of the competitive (in) season. The severity of each injury was defined as slight, minor, moderate, or major depending on whether the player was absent from training or competition for two to three days, four to seven days, one to four weeks, or more than four weeks, respectively. Re-injury was defined as an injury of the same nature and location involving the same player in the same season. Data were analysed using SPSS (Chicago, Illinois, USA). Descriptive and comparative data are presented. The χ2 significance test was used to investigate differences, and statistical significance was accepted at p<0.05 level. All players agreed to participate in the study and there were no drop-outs during the study period. Of the 91 clubs starting the study, completed injury records for the entirety of the 1997–98 and 1998–99 competitive seasons were attained from 87% and 76% respectively. During the study period, 1025 preseason injuries were documented, comprising 17% of the total number of injuries sustained over the two seasons (6030). The relative number of injuries sustained in each preseason period did not differ significantly. A total of 947 (40%) players sustained at least one injury over the two preseason periods, with an average injury rate of 0.2 per player per preseason. When injuries were analysed with age groups in five year intervals, (as in table 1), there were no significant differences between number of injuries and age based on observed and expected figures. However when age groups were broken down into two age groups, the younger age groups (17–25) sustained relatively more injuries than older age groups (26–35+), (796 v 197, p<0.01). There was no significant difference between player position and relative injury rate nor was there any significant difference between divisions and relative injury rate. Table 2 displays the severity of injuries during pre and in season, 40% of preseason injuries were classified as slight or minor, compared with 31% of in season injuries (p<0.01). The total number of days that players were absent due to preseason injuries was 22 880, an average of 22.3 days missed per injury. The most common major injuries during preseason were muscle strains (19%), fractures (15%), ligament sprains (13%), and meniscal tears (10%). Moderate injuries were most frequently strains (42%), sprains (25%), and tendonitis (8%). The nature of injuries sustained during pre and in season periods is shown in table 3. Injuries grouped as “other” in table 3 include cuts, blisters, bursitis, periostitis, capsular tears, and chondral lesions, with no individual category amounting to more than 1% of all injuries. Tendon related injuries include ruptures, paratendonitis, and tendonitis. During the preseason, there was a decrease in muscular contusions and tissue bruising injuries and an increase in tendon related and overuse injuries. This demonstrates a trend towards a decrease in contact injuries and an increase in non-contact injuries during this part of the season. Table 4 displays the location of injuries during pre and in season periods. The majority of injuries affected the lower limb (89%). The only significant difference in location of injuries between the two periods was that there was a greater proportion of lower leg injuries sustained during preseason (p<0.05). Table 5 details the most common injuries to the lower leg during pre and in season, two-thirds of which were non-contact in the preseason . 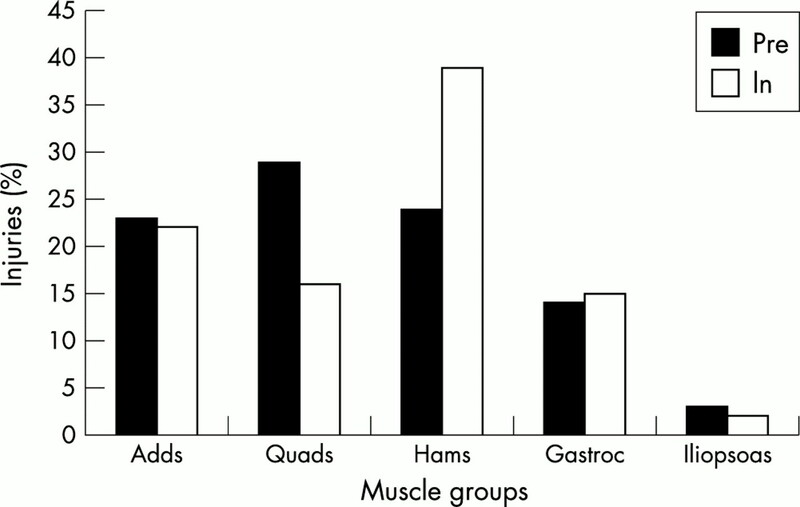 The percentage of lower limb muscle group strains during pre and in season is displayed in figure 1. The only significant difference was that quadriceps strains were relatively more frequent and hamstring strains were relatively less frequent during the preseason. The most commonly strained muscles during the preseason were rectus femoris (29%) followed by adductor longus (12%) and biceps femoris (11%). During the competitive season, biceps femoris (21%) was the most frequently strained muscle, followed by adductor longus (15%), and rectus femoris (14%). The differences in relative incidence of rectus femoris and biceps femoris strains between pre and in season were significant (p<0.01). 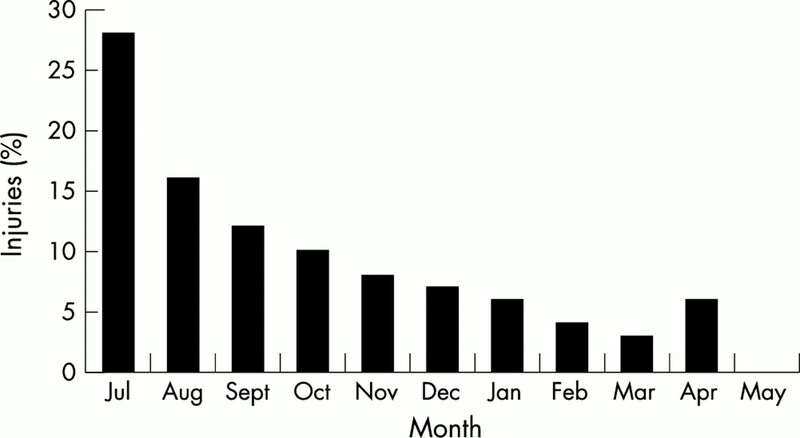 Figure 2 shows the total number of sprains per month. During the preseason, the ankle (59%) was the most common site for ligament sprains, with the lateral ligament complex being more commonly injured than the medial complex (74% v 21%). There were no significant differences in the relative incidence of pre and competitive season ankle sprains. The knee was a major site for sprains during the preseason (30%). The medial collateral ligament accounted for 77% of knee ligament sprains. The lateral collateral ligament was injured in 15% of knee ligament sprains, while damage to the anterior cruciate ligament was limited to 8% of all knee ligament sprains. No posterior cruciate ligament sprains were recorded during the preseason. These figures did not differ significantly during the competitive season. The mechanisms of injury during pre and in season are shown in table 6. There were a significantly greater percentage of non-contact injuries compared to contact during the preseason period (68% v 29%, p<0.01). The percentage of contact injuries during preseason was significantly less compared with the competitive season (29% v 40%, p<0.01). 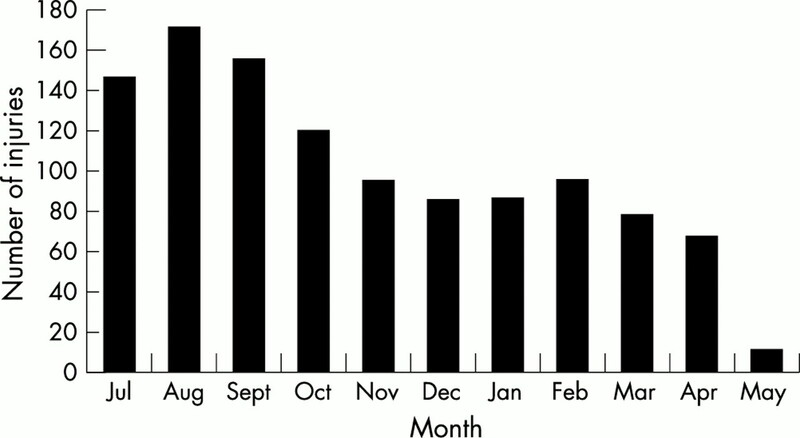 Figure 3 shows the number of Achilles tendon related injuries per month. A total of 32% of Achilles related injuries recorded over the two seasons occurred during the preseason period. There was an average of 3.5 Achilles tendon related injuries per week of preseason and an average of 1 per week of the competitive season (p<0.01). The most common types of injury to the Achilles tendon during preseason were inflammatory conditions (tendonitis or paratendonitis) (94%). The ground condition at the time of injury during the preseason and in season is displayed in figure 4. During the preseason the ground was reported as dry in 70% of cases, similar conditions were reported in 51% of cases during the competitive season. In 40% of in season injuries the ground was wet and/or muddy, such conditions were only reported in 8% of preseason injuries. It has previously been reported that a disproportionately high number of injuries occur during preseason.4 The present study analysed more specifically the injuries sustained during this period. Preseason injuries accounted for nearly one-fifth of the total number of injuries sustained over the two seasons. Other authors have also observed a high injury rate during this period of the football calendar.6,8–10 The younger age groups were more likely to sustain a preseason injury than older players (p<0.01). A reason for this may lie in the suggestion that those athletes with a long history of training do not suffer as severe an effect of detraining as those who are less well trained.11 If this is applied to football, perhaps younger footballers suffer greater detrimental physiological and metabolic effects during the closed season if no maintenance programme is performed, leaving them less physically prepared for preseason training and therefore at a greater risk of injury. It may also be that older footballers are more experienced at dealing with the physical and mental demands during this period of the season. Injuries during the preseason tended to be less severe when compared with the competitive season, with a significantly greater percentage of slight and minor injuries observed during the preseason. It has been suggested that minor injury is often followed by major injury, with a number of these being of the same type and location.12,13 Previous injury itself has also been cited as an important risk factor for injury.14 Quarrie et al15 observed that rugby players who reported a preseason injury had a higher injury rate throughout the season than those who had no injuries during the previous season. As a result of this, the 40% of players in this study who sustained injuries may be at a greater risk of injury during the competitive periods. Ekstrand and Gillquist12 suggested that impairment of timing and neuromuscular coordination may contribute to this increased risk and emphasised the need for prevention and better rehabilitation of minor injuries. The thigh (23%), knee (17%), and ankle (17%) were the most common locations for injuries during the preseason. The only observed significant difference between location of pre and in season injuries was a greater proportion of lower leg injuries during preseason. The increased proportions of muscle strains and tendon related injuries of the lower leg might reflect the increased intensity and duration of training along with an increased exposure to running, commonly experienced during this part of the football calendar. Tendon related injuries were more prevalent during the preseason period (p<0.05). Nearly one third (32%) of Achilles related injuries were sustained during the preseason period (94% were either tendonitis or paratendonitis). Reasons for this high incidence may be explained in terms of some of the major risk factors for Achilles tendonitis; hard ground, resumption of training after a break, poor footwear, and increased intensity of training (especially running).16–19 The timing and nature of preseason training combines all four of these risk factors at once, perhaps predisposing players to Achilles tendonitis. Firstly, the current study reports that the ground condition was dry in 70% of preseason injuries. Secondly, football boots often provide inadequate support because of the inadequate heel lift, soft and high heel counter, and rigid sole20 leading to suggestions that their design may contribute to injury.5,21 Footballers often purchase new boots at the start of preseason without considering the most suitable boot for their foot type. Thirdly, there may be an imbalance between physical loading and adaptation of connective tissue where players have recently returned from reduced activity during the closed season to begin an intensive training programme during the preseason. Finally, the training load increases during the preseason period.5,10,22,23 Junge et al24 observed that top level players (first and second division) practically doubled their training hours per week during preseason (18.5) compared with the competitive season (9.6). Traditionally, preseason training consists of a greater volume of running activities relative to the competitive season. It has been suggested that successive days of heavy running deplete glycogen stores in the specific muscle fibres of the gastrocnemius used in shock absorption and propulsion of the body;19 this may have a detrimental knock on effect on the Achilles tendon by placing it under undue stress. This detailed analysis of pre season injuries showed a significantly greater proportion of overuse injuries during the preseason period, supporting work observed in other studies.8–10 Reasons for this were suggested as the sudden increase in training intensity on a new surface, more intense training, and imbalance between physical loading and adaptation of connective tissue.8–10 As the exact nature of an overuse injury was not defined in our study, a more specific definition is required in future work. The most common type of injury during the preseason was muscle strain or rupture (37%). The rectus femoris muscle was the most common site for muscle strains during the preseason. This may be linked to the increased proportion of injuries caused by running and shooting during the preseason, as the rectus femoris muscle would be heavily involved in both these activities. It is suggested by the authors that prevention of such strains may be possible by appropriate conditioning of the rectus femoris during the closed season accompanied by gradually increasing the volume of running and shooting drills during the preseason. Sprains accounted for nearly one-fifth of all preseason injuries and the ankle was the most common site for sprains. Ankle injuries have a high percentage of recurrence, figures of 56%,23 69%,7 and 75%21 previously being reported predisposing a player to further ankle sprains later in the season. The importance of complete rehabilitation and proprioceptive prevention programmes are therefore emphasised. There was a significantly greater percentage of non-contact injuries compared to contact during the preseason period (68% v 29%, p<0.01), contributing to the decreased proportion of muscular contusions and tissue bruising type injuries during the preseason since these are generally considered to be contact injuries. It may also reflect the increased training to match ratio that is commonly observed during this period and shows that the nature of training is important in determining the mechanism of injury. A total of 25% of preseason injuries were sustained during running compared to 19% in season injuries. Jones25 reviewed the relationship between the parameters of running and injury. Evidence suggested that there was a significantly higher risk of injury with increased running intensity, duration, and frequency. The total amount of running (miles per week) was the most consistently reported risk factor while speed affected injury rates to a lesser extent. This shows the importance of carefully monitoring the volume of running during the preseason period. Adequate time for physiological recovery and adaptation alongside nutritional and hydrational recovery strategies may also help reduce non-contact injuries. The activities performed during the closed season in general may well impact on the injury incidence during the preseason since it has been suggested that those individuals who detrain, even for short periods (2–4 weeks) develop detrimental physiological and metabolic changes.26–30 Such detrimental performance related changes might be decreased if training is maintained even at a reduced level.30 This would suggest that injury risk might be reduced if fitness levels were maintained over the closed season via the implementation of individualised fitness programmes. 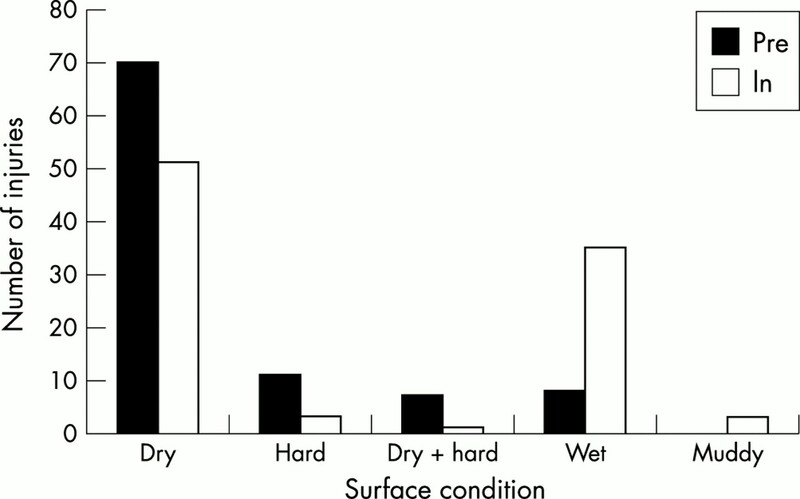 Playing surface would appear to be related to some injuries since there was a disproportionately high number of injuries recorded when the ground was dry and hard. The timing of preseason training during the summer months makes a solution difficult, however, suitable irrigation systems and the watering of pitches may be beneficial. Other forms of training such as aquatic work may also be worthy of consideration. Good running shoes appropriate to players’ foot type for best fit and function are recommended for running drills during the preseason since this may help to reduce injuries (especially of the lower leg) during the preseason. The likelihood of a preseason injury predisposing players to injury later in the season emphasises the importance of adequate and complete rehabilitation of preseason injuries especially slight and minor injuries. Hawkins et al4 confirmed that the football industry has a high risk of injury and it has previously been suggested that occupational safety legislation requires regular health surveillance designed to prevent injuries.31 By applying risk management policies used in industry, it is proposed that the risk of injuries in professional football could be reduced. A risk management policy was created by The Football Association Medical and Exercise Science Department following the findings of Hawkins et al.4 The five main principles of the policy are discussed in relation to preseason injuries. Players are the most important assets to the success of professional football clubs. Injuries to players can have a significant effect on the performance, results, and morale of a team which also impacts on the financial state of the club. If the average time missed per injury is 22.3 days then players who sustain injuries in the latter half of preseason are likely to miss (as a minimum) the first game of the season. The ultimate aim should be to have a football club in which injuries are minimal. Examination of the causes of all injuries and potential injuries can provide valuable insights into inadequacies into risk control and action which could prevent further injury. Muscle strains and ligament sprains are the most common injuries during the pre and in season injuries therefore prevention of these must be addressed throughout the season. However, injuries such as rectus femoris strains, lower leg injuries—especially inflammatory conditions of the Achilles tendon—and overuse injuries require specific prevention strategies during the preseason since they tend to be relatively more prevalent at this stage of the season. Injury prevention should place a heavy emphasis on effectively controlling players, the club management has a major influence on the behaviour of players especially in the design of training programmes and the safety culture it promotes. In relation to preseason this will include ensuring player involvement and commitment to appropriate conditioning programmes during the closed season, recovery strategies including hydration and nutrition, and preventative proprioceptive programmes. A review of training methods during the preseason is also advised along with coach education of the nature and risk factors of injuries during preseason. A positive health culture is crucial and the importance of an integrated approach between coaches, medical staff, fitness/conditioning support staff, together with the players themselves cannot be overstated. This is particularly important during the preseason where prevention of injuries requires contribution from all parties. As younger aged players (17–25) are at greater risk of injury during the preseason, they should be specifically targeted. Even younger age groups in Football Academies and Centres of Excellence should be given quality advice, education, and awareness strategies and started on specific training regimes. A high number of injuries have been observed during the preseason period. The types of injuries that players are predisposed to during this period have been analysed and strategies to reduce such injuries suggested. The next step is to analyse the risk factors for specific injuries and measure the success of prevention strategies by continuing the audit cycle. An obvious weakness of this study is the lack of exposure data, meaning that real injury risk cannot be calculated. It also makes it difficult to compare these results with the results of previous studies which have included exposure data. However, due to the large number of clubs and players involved in the study, it would have been difficult to obtain accurate exposure data. It is suggested that a future study including exposure data could be performed on a smaller sample of players. Other areas that warrant further investigation include quantifying the risk of developing an injury (moderate or severe) during the competitive season following a preseason injury (minor or slight), an in depth analysis of current trends in preseason training, and best practice of prevention and rehabilitation of the most common injuries in football. There are a high number of injuries during the preseason months compared with a similar time period during the in season. Muscle strains and ligament sprains are the most common injuries during both the pre and competitive seasons, rectus femoris strains, lower leg injuries including Achilles tendinits, overuse injuries, and minor injuries are relatively more common during the preseason. A risk management approach for the prevention of such injuries is recommended. We wish to acknowledge the financial support given by The Professional Footballers’ Association together with the support of The League Managers Association, The Premier League, and The Football League, and the commitment of the medical practitioners working at professional football clubs in England and Wales. We also gratefully acknowledge the contributions made by the members of the Project Consultative Committee Working Group, namely Mr R Myles Gibson (Chairman), Dr C Cowie, Dr M Waller, Mr G Lewin, and Mr A Jones. Shephard RJ. Biology and medicine of football: An update. J Sports Sci1999;17:757–86. Metzl JD, Micheli LJ. Youth Soccer: An epidemiologic perspective. Clin Sports Med1998;17:663–73. Boon G, Jones D, Rawnsley P, et al. Deloitte and Touche Annual Review of Football Finance 2001: Manchester. p. 5, 14 and 16. Inklaar H. Soccer Injuries. II Aetiology and Prevention. Sports Med1994;18:81–93. Ekstrand J, Hilding J. The incidence and differential diagnosis of acute groin injuries in male soccer players. Scand J Med Sci Sports1999;9:98–103. Arnason A, Gudmundsson A, Dahl HA, et al.Soccer injuries in Iceland. Scand J Med Sci Sports1996;6:40–5. Engstrom B, Forssblad M, Johansson C, et al. Does a major knee injury definitely sideline an elite soccer player. Am J Sports Med1990;18:101–5. Ekstrand J, Gillquist J, Moller M. Incidence of soccer injuries and their relation to training and team success. Am J Sports Med1983;11:63–7. Koutedakis Y. Seasonal variations in fitness parameters in competitive athletes. Sports Med1995;19:373–92. Chomiak J, Junge A, Peterson L, et al. Severe injuries in football players: Influencing factors. Am J Sports Med2000;28:S58–67. Dvorak J, Junge A, Chomiak J et al. Risk factor analysis for injuries in football players: Possibilities for a prevention program. Am J Sports Med2000:28;S69–S74. Quarrie KL, Alsop, JC, Waller AE, et al. The New Zealand rugby injury and performance project. VI. A prospective cohort study of risk factors for injury in rugby union football. Br J Sports Med2001;35:157–66. Galloway TM, Jokl P, Dayton W. Achilles tendon overuse injuries. Clin Sports Med1992;11:771–82. Nichols AW. Achilles tendinitis in running athletes. J Am Board Fam Pract1989;2:196–203. Clement DB, Taunton JE, Smart GW. Achilles tendinitis and peritendinitis: Etiology and treatment. Am J Sports Med1984;12:179–84. Brukner P, Khan K. Clinical Sports Medicine. Sydney, Australia: McGraw-Hill Book Company, 1997. Ekstrand J, Gillquist J. The avoidability of soccer injuries. Int J Sports Med1983;2:12–128. McGregor JC, Rae A. A review of injuries to professional footballers in a premier football team (1990–1993). Scott Med J1995;40:16–18. Junge A, Dvorak J, Rosch D et al. Psychological and sports specific characteristics of football players. Am J Sports Med2000;28:S22–S28. Jones BH, Cowan DN, Knapik JJ. Exercise, training and injuries. Sports Med1994;18:202–14. LaForgia J, Withers RT, Williams AD. Effect of 3 weeks of detraining on the resting metabolic rate and body composition of trained males. Eur J Clin Nutr1999;53:126–33. Amigo N, Cadefau JA, Ferrer I, et al. Effect of summer intermission on skeletal muscle of adolescent soccer players. J Sports Med Phys Fitness1998;38:298–304. Hortobagyi T, Houmard JA, Stevenson JR, et al. The effects of detraining on power athletes. Med Sci Sports Exerc1993;25:929–35. Simsolo RB, Ong JM, Kern PA. The regulation of adipose tissue and muscle lipoprotein lipase in runners by detraining. J Clin Invest 1993;92:2124–30. Neufer PD. The effect of detraining and reduced training on the physiological adaptations to aerobic exercise training. Sports Med1989;8:302–21. Fuller CW, Hawkins RD. Developing a health surveillance strategy for professional footballers in compliance with UK health and safety legislation. Br J Sports Med1997;31:148–9. Injuries are a significant threat to the health and performance of football players. Obtaining detailed information on the injury patterns and risk factors at different levels of play is an important first step towards injury prevention. This is the first large scale study to provide a detailed description of the preseason injury panorama in professional football. The authors collected injury reports from club medical staff from Premier league through 3rd division over two competitive seasons, including more than 6000 injuries. The injury pattern during the preseason was remarkably similar to that observed during the season, with muscle strains being the most common injury type. There appeared to be fewer hamstring strains and more quadriceps strains during the preseason, but the most important differences may be that overuse and tendon related injuries were relatively more common during the pre season compared to the season—especially Achilles tendinopathy, and that younger players appeared to more prone to injury than older players. Nevertheless, there is one important limitation that needs to be kept in mind when interpreting the results. When preseason injuries are compared with in season injuries, the results show the relative difference in injury distribution with respect to injury types, injury locations, etc. However, since exposure data were not collected, it is not possible to compare the rates of injury—that is, the true risk of a particular injury type—between the two phases of the season. For example, although the proportion of tendon overuse injuries is higher in the preseason compared to the season, the actual rates of tendon overuse injuries are unknown. The rate of tendon overuse injury may even be lower during the preseason, as training volume is high. Future studies that include an accurate exposure registration are necessary to compare the true injury rates. Even with this limitation, the relatively higher proportion of Achilles tendon and quadriceps muscle problems may result from a sudden increase in running and shooting, as pointed out by the authors. During the preseason there is a large increase in training load, particularly for players who do little or no conditioning in the off season. Abrupt changes in training volume and intensity are assumed to be a major risk factor for overuse injuries. Future studies should examine the relationship between off season fitness maintenance and preseason risk in footballers. But in the mean time, it seems safe to assume that the better a player maintains his fitness level during the off season, the lower the risk of overuse injury during the preseason.